The great Danzig, who would eventually sire 202 stakes winners (18.8% from foals), didn't take long to prove himself when his first runners hit the track in 1984. His daughter Contredance won the Adirondack (gr. II) and Arlington-Washington Lassie (gr. I), and son Stephan's Odyssey took the Hollywood Futurity (gr. I). But the big horse was Chief's Crown, a winner of four grade I's at 2—the Hopeful, Cowdin, Norfolk, and inaugural Breeders' Cup Juvenile—en route to championship honors. Chief's Crown was produced from the Secretariat mare Six Crowns, and you might have expected the combination to inspire breeders to send Danzig plenty more daughters of the chestnut Triple Crown winner. Thankfully this didn't happen in any great excess. Danzig did get three Secretariat mares in the season following Chief's Crown's championship (they produced two unraced horses and a winner over jumps), but Secretariat mares never actually occupied a high proportion of Danzig's book. 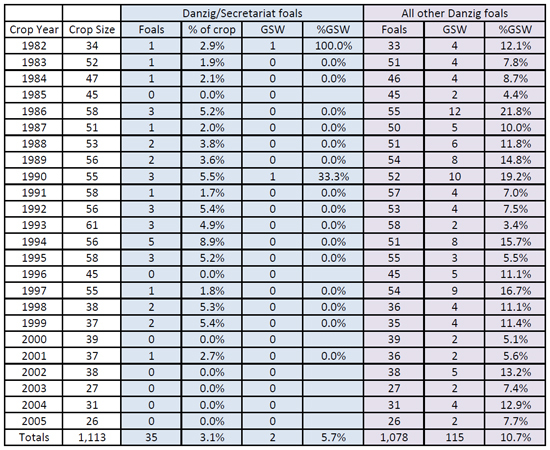 Of 35 Danzig/Secretariat foals, only Lost Solider (foal of 1990) could match Chief's Crown as a graded winner, and percentage-wise Danzig was nearly twice as good at getting graded winners with non-Secretariat mares. Chief's Crown's success as a runner was not an indicator of an emerging Danzig/Secretariat nick (TrueNicks D rating). A.P. Indy's first big horse was Pulpit (TrueNicks,SRO), out of the Mr. Prospector mare Preach. Academically, Pulpit never won a grade I, but he was one of the most impressive maiden winners in years, won the Fountain of Youth and Blue Grass (both gr. II), and ran a huge fourth in the 1997 Kentucky Derby (gr. I) when sustaining a career-ending injury. Adding to A.P. Indy's case for Mr. Prospector mares in his initial crop were graded 2-year-old winner Accelerator and Tomisue's Delight, second in the Kentucky Oaks (gr. I) and eventually a dual grade I winner. With A.P. 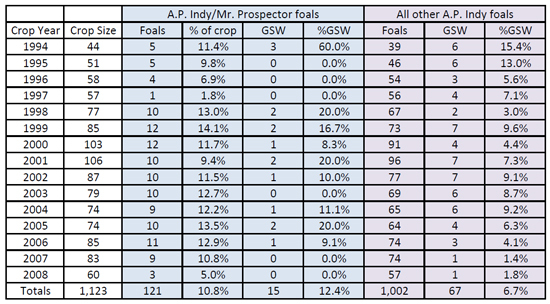 Indy producing three graded winners from five Mr. Prospector mares in his first crop, the message was clear, and A.P. Indy was rewarded in kind. Indeed, over 10% of his lifetime foals are out of daughters of Mr. Prospector. From A.P. Indy's first crop conceived after the important 1997 racing season, he sired two champions out of Mr. Prospector mares: 2-year-old filly Tempera and Horse of the Year Mineshaft (TrueNicks,SRO) (full brother to Tomisue's Delight). Considering 3-year-olds and up, A.P. Indy/Mr. Prospector's 12.4% graded winner strike rate is nearly twice as good as A.P. Indy with all other mares. With over 10% of his foals out of Mr. Prospector mares, A.P. Indy consistently gets top runners from this nick (TrueNicks A rating). It's always interesting to look back at how nicks develop over time, and history's lesson here is that it should take more than just one successful racehorse to justify an aggressive push to replicate that mating. From a nick rating perspective, TrueNicks requires at least two stakes winners (or a large number of starters) before rating a specific cross. This requirement helps avoid prematurely embracing the Danzig/Secretariat types, and helps identify the stronger combinations that aspire to be like A.P. Indy/Mr. Prospector.